I have four advertising graphics that must be made into simple 300x250 animated GIFs. 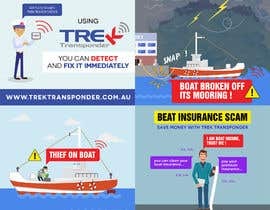 We are selling a product for boats that will automatically send an SMS to a boat owners mobile phone if his boat is in danger. The GIFs should be black and white with one or two colours to keep them simple and clear. 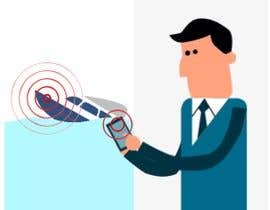 The purpose of the animation is to attract the eye of the customer by telling a simple story. The bottom of the GIF should carry a message and our web page address. If the customer who looks at the GIF clicks on it it should link to our website. The starting artwork for them is attached. Some part of the artwork should move to attract attention. For example the boat sinking GIF should show the boat sinking. 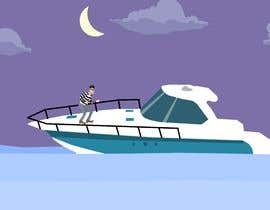 The thief on boat GIF should show the thief moving. The mooring GIF should show the mooring line break and the boat move away. The insurance GIF should show the insurance man with HUGE smile waving the money. All of them should show the customer getting a message on his phone saying his boat is in danger. (You can see our product we want to sell with these GIF here [login to view URL]). Please check #33 I updated my entry. Dear contest holder , kindly extended contest time . I'm working on your contest still. i hope give you some nice project.so need more time for me and other also. The advertisement should be visible on mobile phone and Windows PC. If any other format can do that it is OK. Because GIF is old format it works an all. can i make it colorful like motion graphic animation ? Yes. But because it is small it must be simple and easy to see. do you have any specific seconds duration for each gif animation ? The message is important. My artwork is only a suggestion. Better artwork is welcome. Many words can be omitted to make the message clear. That is OK.